Henessy Manjing is lost in Libya. His dreams of returning to London remain but a dream. BBC photo. The 18-year-old from South Sudan knew he might perish on the treacherous crossing from Libya to Europe. So far this year, the Mediterranean has claimed an estimated 2,400 migrants and refugees. But before he ever reached the shore, Hennessy was kidnapped, beaten and almost shot. The teenager says he left home in 2016 after family problems resulted in death threats. He is behind bars in the Triq al-Sika detention centre in Tripoli, along with around 1,000 other men. Most we met were Africans in search of work who were stopped at sea, or trying to get there. Now they are jammed into a warehouse, bereft of light and struggling to breathe. In the sweltering heat they are melding together – a tapestry of jumbled limbs, and torment. “When they find their journey ends here, they are completely broken,” said one official at the centre. Some try to fan themselves with scraps of cardboard. At night, when the doors are locked, they have to urinate in bottles. The gaunt teenager spoke with a London accent – the legacy of three years spent living in the UK with his family. Hopes of getting back there led him first to Egypt, and then across the border to eastern Libya. He says that’s where an armed gang kidnapped him and about 40 others from their trafficker. “We saw people holding guns and sticks, and they forced us into trucks,” he said. He sought help from a local man, who returned him to one of the kidnappers. Hennessy was given a fake visa to fly to Tripoli, but on arrival he was arrested by a militia and taken to a detention centre near the airport. The weapon of choice for the guards was a water pipe. 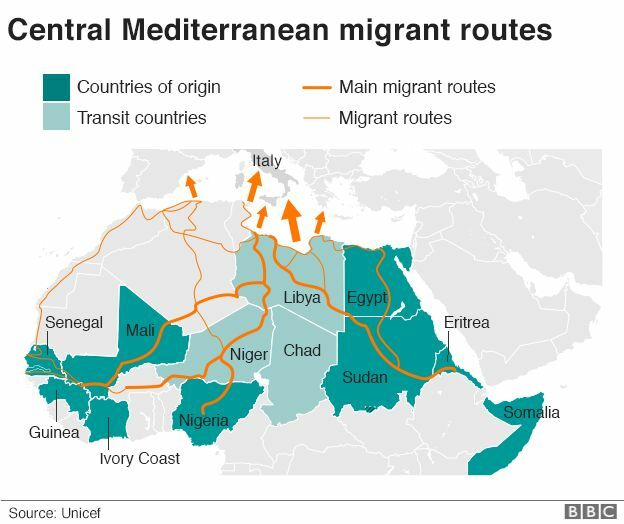 Some of his fellow detainees outlined other hazards on the migrant trail through Libya – being bought and sold by militias, used as slave labour, and forced to bribe guards to be released from detention centres. He said that was the handiwork of jailers in the Libyan town of Bani Walid. They forced prisoners to call home, while being brutalised, to extort money from their relatives. “When we call, we are crying. They beat you on the head. There are some people who don’t want to obey – they burn their body. Osman’s freedom – which was short-lived – cost his family $5,000 (£3,800). When I asked if he still wanted to get to Europe, he covered his eyes with the towel and began to weep. Emmanuel John, an 18-year-old who speaks perfect English, said he was beaten from the moment he crossed the border, and feared he would die. “The smugglers that brought us to Libya handed us to others, from the same network,” he said. “Two girls were raped in the room beside us,” he said. He told us the girls were aged about 15 and 19, and were travelling with their family. 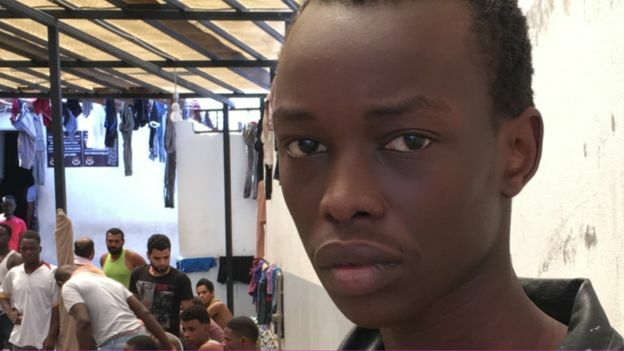 The European Union wants Libya to do more to prevent migrants like Emmanuel reaching Europe. But those intercepted by the Libyan coastguard are being returned to an unstable country, with a collapsing economy, that can barely feed them. 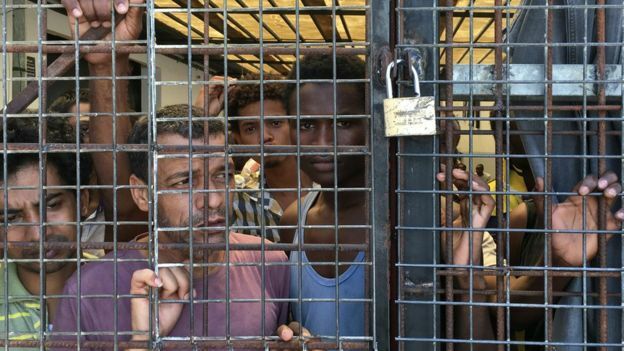 Detainees in the hot houses which are Libya’s migrant detention centres. Food and conditions are appalling inside. BBC photo. A recent United Nations report condemned the “inhuman conditions” in Libyan detention centres highlighting “consistent reports of torture, sexual violence and forced labour”, and cases of severe malnutrition. Breakfast time at Triq al-Sika was long on queues, and short on food. Each man received a small bread roll, some butter, and a single cup of watery juice. The detainees wanted us to witness this, as did the officials in charge. They say they have run out of money to pay their suppliers and are now relying on donations. Those behind bars here are effectively prisoners, who don’t know their sentence. They can be held indefinitely – with no legal process. Their only hope of release is to be sent back to their home country. Three-month-old Sola has been in detention for most of his short life. We found him in the women’s section, sleeping peacefully on a faded mattress. His young mother, Wasila Alasanne, tried to take him across the seas to Italy when he was just four weeks old. “Our boat broke and the police arrested us on the water,” she said. Wasila’s husband is being held in a different detention centre. She has no idea when they will be reunited, or when they will free. Her home country, Togo, has no ambassador in Libya. Now she can only dream of deportation, as she used to dream of Europe.